Three friends and I went to my High School graduation Celebration Dance in San Salvador, Capital city of El Salvador (Central America) we arrived to the place at about 8pm. We spent about 3 hours there and suddenly we decided to go to a beach in a place called Conchalio in the state of La libertad, about 45 minutes of San Salvador. Since one of my friends got his fathers car (a Chevrolet 1956) we arrived to the beach place at about 11:45pm. Checked in the Hotel and went to a place to get some food and drinks (I do not drink nor smoke) but two of may friends were drinking part of the night. We were talking to each other under an almond tree in front of the beach, when suddenly an object shapped like a disk with some dome form and lights all over came down and suddenly hovering for about 50 seconds. It was projecting a very intense light over the water (we were approximately about 400 feet of distance to the object). 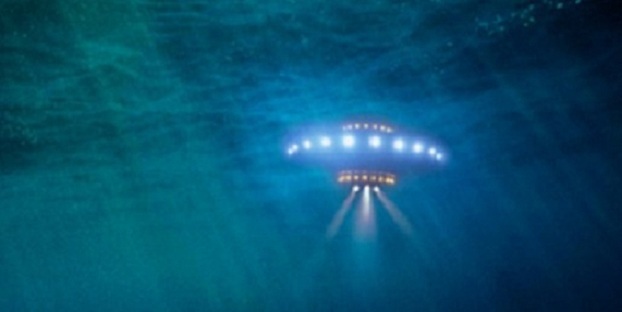 We though it was a giant pole of a ship, but when it started spinning with many colorful lights on it and the big light started a twist on the water, all of us knew it was a UFO because it suddenly disapeared into the water and it did not appeared again. We did not see any splash at all because the water was moving around like creating a tunnel or hole in the water. After that moment we decided to go back to the hotel about one block from the place because we were scared about what happened. That morning I commented the incident to some people from the hotel and they told me that those things use to happen very often in that particular area and no one makes a big deal of that anyway. NOTE: The above image is a rendering.